Food Industry News: PepsiCo Stock Hits 32-Year High, but Why? Home / Industry News / 2013 / PepsiCo Stock Hits 32-Year High, but Why? PepsiCo Stock Hits 32-Year High, but Why? When its first-quarter earnings exceeded analysts’ expectations, PepsiCo Inc.’s stock hit a 30-plus year high April 18, according to split-adjusted data compiled by Bloomberg. While a number of analysts voiced admiration for the world’s largest snack maker, some of the buoyancy also may be due to the interests of a large investment fund. Trian Fund Management, led by activist investor Nelson Peltz, announced the same day it had increased its investment in PepsiCo to $269 million. The fund also has a $494 million in Mondelez International, according to ValueWalk. The 3 percent jump in PepsiCo stock (closing at $81.25 per share) came despite a 4.6 percent dip in first-quarter net income, to $1.08 billion, or 69 cents a share, from $1.13 billion, or 71 cents, a year earlier, the news service reported. But core earnings per share were 77 cents, beating the 71-cent average of 14 analysts’ estimates compiled by Bloomberg. * PepsiCo Americas Foods organic revenue grew 6 percent in the quarter driven by organic revenue growth in all divisions, including Frito-Lay North America, Quaker Foods North America and Latin America Foods. * Frito-Lay North America market share in the U.S. grew in the quarter, reflecting 4 percent volume growth driven by strategic investments and disciplined execution. * PepsiCo Americas Beverages core constant currency operating profit grew 4 percent in the quarter reflecting favorable effective net pricing and productivity gains. * Revenue in the Asia/Middle East/Africa segment grew 15 percent in the quarter (net revenue declined 14 percent). * On an organic basis, emerging and developing market revenue grew 12 percent. 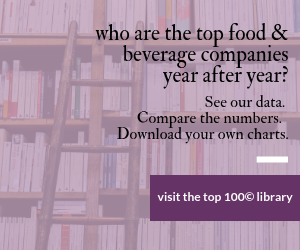 * On an organic basis, international beverage volume grew 6 percent and international snack volume grew 5 percent. * On track to return a total of $6.4 billion to shareholders in 2013 through approximately $3.4 billion in dividends and approximately $3.0 billion in share repurchases. PepsiCo last year acknowledged an introspection of its businesses amidst flagging sales growth and hinted at a restructuring. Increased marketing across the board and a particular emphasis on carbonated drink sales were earmarked.